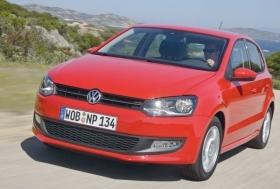 Strong demand for the new Polo boosted VW's H1 German sales 31.2%. MUNICH -- Volkswagen groups global vehicle sales fell 5 percent to 3.1 million in the first half, but the companys nine brands, which will soon include Porsche as a 10th marque, boosted market share. By comparison, General Motors Co.'s first-half sales fell 21.8 percent to 3.5 million, the company reported earlier this week. At the end of 2008, GM ranked second in global sales and VW was No. 3. Toyota, which has not reported first-half sales yet, ranked No. 1 last year. VW said it increased its share of the world passenger-car market to 12.0 percent in the first half, compared with 9.9 percent the year before, amid an 18 percent slump in the overall global car market. Detlef Wittig, the carmakers sales and marketing chief, said "the comparatively good trend in the sales figures showed that the group is headed in the right direction. VW, which on Thursday agreed to integrate Porsche into its portfolio of brands ranging from Bentley to Skoda, aims to overtake Toyota as the worlds biggest automaker by unit sales by 2018. Everything is running (according) to plan. Nevertheless, a major effort is needed in the second half of the year if we are to remain on course. Economic uncertainty will continue as the year progresses," Wittig said. VW brand deliveries rose by 2.2 percent in the first half to 1,949,000, helped by sales increases in Germany, Brazil and China. First-half sales in Germany were up 31.2 percent to 418,870 units. The Audi, Skoda and Seat brands developed better than the overall market, VW said. VW groups China sales, which include the VW, Audi and Skoda brands, rose 18.6 percent to 723,800 units in the first half. European sales fell 11.7 percent to 1,662,900 and in North America, sales were down 12.6 percent to 221,900. In Brazil, deliveries rose by 6.1 percent to 335,700. The group, which is Europes biggest carmaker by sales, increased deliveries in June by 6.5 percent to 609,800 units. In 2008, VW groups global sales, including its Scania truck division, rose 1.1 percent to a record 6.3 million units.